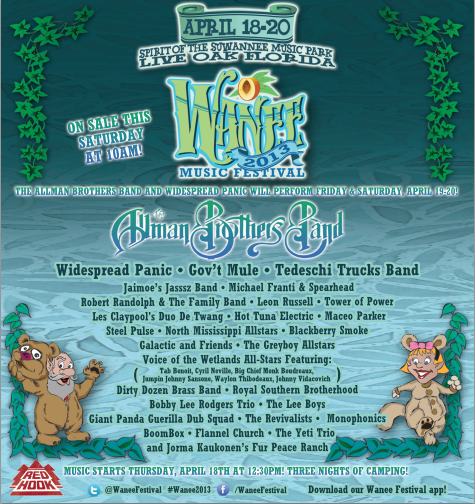 This year's Wanee Festival will include 3 nights of camping, 2 performances by Widespread Panic and the Allman Brothers Band, sets from Gov't Mule, Tedeschi Trucks Band, Robert Randolph, Leon Russell, Jorma Kaukonen, Dirty Dozen Brass Band and more. The killer lineup is sure to produce incredible collaborations, and will bring 20,000+ fans to The Spirit of Suwannee Music Park in Live Oak, FL, from April 18th-20th. Tickets go on sale this Saturday, January 25th at 10am EST.